By Michael Cannon, Founder & CEO, Silver Bullet Group, Inc. Numerous studies confirm that many business-to-business companies lose billions of dollars annually as a result of ineffective customer messaging. It’s not that companies are ignoring messaging. On the contrary, they spend significant time and money on company, market, and product-specific messaging – all for the most part descriptive rather than persuasive. The problem is that these companies need to focus a lot more of their messaging dollars on creating effective sales messaging, a new messaging category that, when implemented, consistently results in impressive gains in a company’s revenues and market share growth. As a result, sales and marketing effectiveness is reduced by about 25% and costs US companies over $100 billion every year. For example, most BtoB messaging, like company messaging, market messaging, product messaging and even most value propositions, is ‘descriptive.’ It provides a description of what the company does, the customer served, the products and services offered, the features of each offering, and, if done well, a little bit about the benefits of doing business with that particular company and the benefits of buying its offerings. What Sales (inside, field and channel) also want most is to have and to provide customers with persuasive answers to these same buying questions. You can see the gap. Most of the messaging provided to prospective customers and to Sales is ‘descriptive’ company messaging, market messaging and product messaging, none of which provides persuasive answers to the key buying questions. What is missing is ‘persuasive’ sales messaging. It’s the missing messaging category in almost every company’s customer messaging platform. Sales messaging is the missing messaging category in almost every company’s customer messaging platform. As you can see, marketing and sales effectiveness is significantly reduced when Marketing produces only company, market and product messaging. key competitor’s market share and win an incremental $1M in revenue in just 7 months! – Angelo Umali, SAD, Sales and Technical Support Engineer, Agilent Technologies, Inc.
– Barbara Wehrle, Director, Western Region, SilverStream Software, Inc. These significant improvements in marketing and sales effectiveness consistently occur when Marketing provides persuasive answers to the customer’s key buying questions and enables Sales to do the same. It’s simple and powerful. Use customer sales messaging as a tool to improve the quality of your customer messaging and you will make dramatic improvements in the effectiveness of all your sales and marketing investments. This messaging strategy works like a ‘silver bullet’ to help you accelerate revenue, market share growth and your career. Posted in Staying on Message and tagged B2B Customer Messaging, sales, sales messaging, Sales Tip, sales tips on July 31, 2015 by softwaresalesjobsblog. By Tony Horwath, President and Founder, Sales Focus, Inc.
No matter how long or what type of sales experience you have acquired over the years, your definition of selling determines how successful you are now as how successful you will be going forward. If your basic definition of selling is off base, your entire sales process and ultimately your long-term success will be affected. The way you define selling is the ground floor on which all other aspects of the sales process are built. In other words, garbage in results is garbage out. It won’t matter how much you know about your company, their products and services, or how well you have memorized responses to every possible objection. What will matter most is how you fundamentally define selling. Consider the following statement as a first step in defining selling. We’ve heard this many times before, but remember the definition of insanity is doing the same thing over and over, getting the same results but expecting something different to happen as a result of your actions. If you want to change your success in selling, you may need to truthfully examine what you are doing and not be focused on what your company isn’t doing! Eighty percent of the reason why a sales person fails is due to an internal issue, not an external one. So when you fault your company, the competition, or the industry, you are only addressing 20 percent of the problem! First, selling is a process with defined steps that build on each other. Like exercise, every time you skip a step it reduces the possibility of a positive outcome. A weight lifter can only bench press the big weight so long without practice before they are lifting less and less weight. Selling is the act of proactively engaging in the process. Selling involves methodically executing each step in a methodical way for every sales process. Taking short cuts or eliminating steps only sets the salesperson up for future failure. Next, selling is a process of discovery. If the prospects don’t discover ‘it’ for themselves then they typically don’t have personal ownership. When a sales person ‘tells’, the probability of a buying decision is greatly diminished. Parents quickly learn this with their children. If a child doesn’t have ‘skin in the game’, they will not manage and take care of whatever the parent has provided. Prospects are no different. They need to have ownership in the sales process. Helping a prospect requires asking questions (probing) that reveal their needs. Most prospects didn’t go to school for sales so it is highly unlikely they will be able to tell you their needs. In fact, most prospects will ask the last question first, “How many dollars will this cost me?” In most cases, you can help them by asking questions that cause them to think through their process and identify their needs. That’s when real buy-in occurs. Finally, selling is revealing something of value. Listen to your presentation and objection handling words and sentences. Do you know the difference between a feature statement and a value statement? People don’t buy features: they buy value. They must define the value for themselves and not have you define it for them. Your responsibility is to guide them along the path of discovery. For example, let’s suppose that someone was going to buy a pen. They walk into the ‘writing implements boutique’ and the sales person starts describing all the features of their pens including the “Zircon heat treated pocket clip, guaranteed for life against breakage”. This usually occurs right after the sales person asks, “how can they help the customer?” What they don’t do is ask questions or observe that the prospect wears shirts with no pockets. Therefore, they may not have a need for a pen with a Zircon heat-treated pocket clip! The feature ‘Zircon heat treated pocket clip’ has no ‘value’ to the prospect. Nothing of value was being revealed, so the probability of a sale is greatly diminished. The person walks out of the store and probably mutters something like “I’m just looking”! It doesn’t matter that you have at your command one million super selling tips, or know how to build trust with just about anybody in ten seconds or less, or how to get the appointment when the prospect says no, or know how to negotiate for a win-win scenario. It doesn’t matter that you can speak with eloquence and passion. What does matter is knowing and living by what your definition of selling is. This drives your trust factor, your negotiations, and your success. Are you just taking orders for the present and missing out on selling value for the future? Or, are you “helping someone discover something of value”? Remember the new definition of selling is “Selling is the process of helping someone discover something of value”. Can you incorporate value into your selling process? Posted in Increasing Sales and tagged executive sales, sales, sales skills, sales techniques on July 30, 2015 by softwaresalesjobsblog. In early 2007, when I first sat down with Geoffrey Moore, author of “Crossing the Chasm” and other best-selling business books, at Bucks Restaurant in Woodside, CA, we knew that the market was ready for technologies that could support a new selling model. From Geoff’s experience with clients of his consulting practice and from my vantage point as the former CMO of WebEx, we had already experienced first-hand the shift to higher volume, higher velocity sales models and the resulting need for solutions to support the new breed of sales teams. The New World of selling was already here, and companies like WebEx, Oracle and Salesforce.com had already “cracked the code” of using the Web to sell more, faster, but a collective understanding of best practices and applicable solutions hadn’t yet been developed. Geoff came up with the term “Sales 2.0” to describe the new selling model and the technologies that support it, and thus, was born the idea for a Sales 2.0 Conference that would bring together fellow practitioners and solutions providers to articulate and evangelize best practices. In his keynote address at the first Conference in October of 2007, Geoff asserted that the time had come for this event, where practitioners could share how they were using Web 2.0 technologies and techniques to sell faster and to better serve their customers. He said, “We are just beginning to define Sales 2.0. One thing is for certain it will evolve.” He couldn’t have been more correct. In two short years, Sales 2.0 has quickly become part of the business vernacular and become a business imperative for companies looking for cost effective ways to sell more without increasing their spending. We have learned a lot about Sales 2.0. Books, whitepapers, blogs, our third conference, and even this e-book, are devoted to keeping pace with the latest thinking about how we can sell smarter with Sales 2.0. In today’s challenging times, Sales 2.0 has become a rallying cry not just for Sales but also for marketers who are increasingly working with Sales to grow pipelines, cultivate qualified leads, drive topline growth and provide excellent customer service. I would only add that it combines the art of selling with the science of marketing where communications are increasingly personalized and everything is measurable. In many organizations, sales teams have been the early Sales 2.0 adopters, using Web conferencing, for example, to shorten the sales cycle. Marketers have sometimes been challenged to keep up, but this is changing as well. Their role has been redefined by Web 2.0 technologies, media and a new economic landscape. Today’s web-smart marketers are now adopting the best practices learned from their e-commerce counterparts. In an e-commerce world, everyone is in Sales and every customer action is tracked, from the instant the customer enters the site, to the time they add items to the shopping cart, and all the way through “check out”. Marketers are learning to better nurture and qualify customers and achieve a more effective and timely handoff to the sales rep, the B2B equivalent of the e-commerce “shopping cart”. Today, if you conduct business online, you are in sales. And sales is about building relationships. Sales 2.0 helps by building and nurturing relationships through the effective and timely exchange of information. Sales 2.0, as part of an orchestrated marketing automation program, enables marketers to target vast numbers of potentially interested customers in a personalized and relevant way and then instantly get Sales in the loop when a prospect shows interest. Through marketing automation, marketers can also cast out a wider net at the top of the funnel and automate campaigns, with contagious content that attracts, educates and nurtures prospects. Lead scoring tracks and updates the prospect’s sales readiness throughout the buying cycle. When the threshold is met, the lead is converted to an “opportunity” and Sales receives an instant alert which highlights this change status, score or indicates that qualifying action has taken place. Sales then can respond with appropriate and timely information to better serve the customer and, hopefully, close the deal. In this manner, marketing automation fulfills the promise of Sales 2.0 by leveraging Web 2.0 technology to better serve the buyer throughout the entire buying process. In today’s economic environment it’s not surprising to see Sales 2.0 move up the “Sales funnel” to ensure that both Sales and Marketing can work together for this kind of real-time customer engagement. In short, it’s providing measurable success. Genius customers, like land developer Redstone Properties, are able to quickly send out personalized email marketing campaigns from their head office and have local reps reach out to buyers who are interested in their local properties. Recently this Sales 2.0-enabled teamwork resulted in a same day close of a property in Colorado. The customer got a great deal. Redstone got a 6-hour sales cycle. Everybody won. 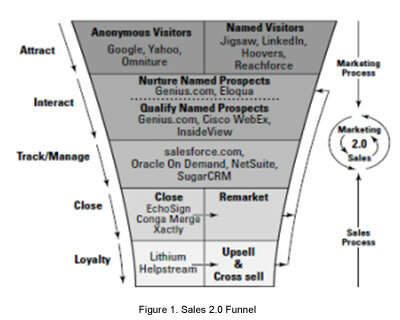 In the new Sales 2.0 funnel, Marketing works the unqualified leads at the top of the funnel with increasingly automated efforts and Sales works the qualified leads toward the bottom providing personal attention that addresses questions or objections that helps move the buyer through their buying cycle. As information is exchanged, Sales and Marketing dynamically engage with each other to determine the status of the lead and whether it requires immediate follow up or further lead nurturing. In today’s Sales 2.0 world, the sales process looks less like a linear progression and more like a basketball game where the ball is moved down the court by Marketing and passed off to Sales for the score. Sometimes multiple handoffs are required as the team adapts to blocked shots or sets up a new play. Both Sales and Marketing are also starting to use social networking services like LinkedIn to research prospects, and Twitter to quickly and easily broadcast their latest success or upcoming event. These “anytime, anywhere” online interactions speed up the sales cycle. The interactions move beyond the “pitch” and towards “advice” and it’s taking the sales process beyond the board room or even a 9 to 5 cubicle shift. Your customers and prospects are visiting your website and interacting with their peers online outside of business hours. You need to know about it. You need to know what they were looking at and what they are chatting and tweeting about. Sales 2.0 helps you create closer connections with your prospects and keep them highly engaged with you. All this means that the traditional sales and marketing methodologies, where customers are informed of certain value propositions over a regimented series of steps, have been thrown out the window. Customers are dynamically engaging with companies, ad-hoc and on the fly. Sales 2.0 is about adapting to customer’s buying behaviors and helping them when they need it. Selling today isn’t about selling so much as it’s about helping customers buy. Ultimately, Sales 2.0 is about aligning your entire enterprise to target and serve your buyers more effectively which brings in more business at a lower cost. Posted in Staying on Message and tagged sales, sales messaging, sales tips on July 30, 2015 by softwaresalesjobsblog.